Uber said Wednesday it plans to add mass transit, bike-sharing and other options to its mobile app, as it unveiled a vision for urban transport that goes well beyond its core ridesharing offer. 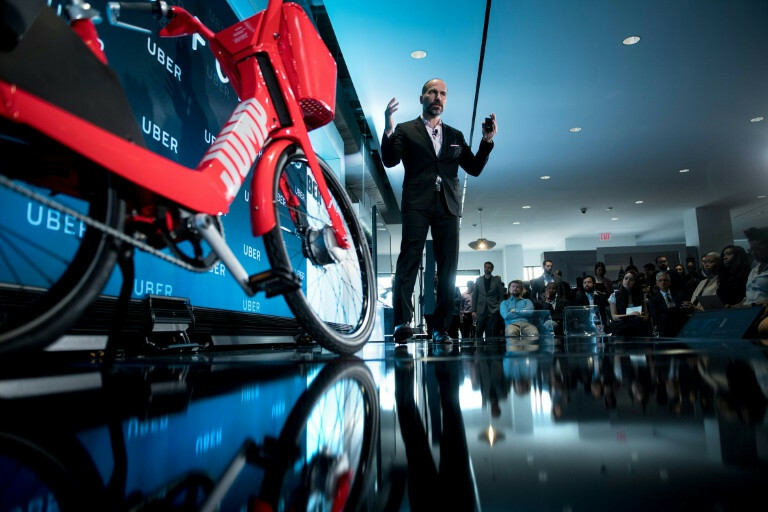 Chief executive Dara Khosrowshahi presented the plans during a visit to Washington, where he said the ride-hailing pioneer would seek a more diversified model offering various transport options, including car rentals on a partner peer-to-peer service. "More and more, Uber is not just going to be just about taking a car, but is about moving from point A to point B in the best way," Khosrowshahi told an event in the newly launched Uber driver center in the US capital. Khosrowshahi said the Uber app would start including locations for electric bikes from its newly acquired bike-sharing group Jump, which currently operates in Washington and San Francisco. Uber also announced a partnership with the peer-to-peer car-sharing service Getaround to allow users to rent vehicles from individual owners, with a launch planned later this month in San Francisco. The service will be labeled Uber Rent. "You can use your Uber app if you need a car and you want to drive yourself, if you need a car for an hour, a day," the Uber chief said. For mass transit, the San Francisco startup said it would allow app users to see various options and would launch a partnership with e-ticketing service Masabi that would eventually allow the Uber app to be used instead of tickets or passes. Masabi has partnerships with transit systems in Boston, Los Angeles, Las Vegas and New York, as well as train and transit operators in Europe. Khosrowshahi said the new plans would help Uber offer solutions for an increasingly urban world population and reduce the need for car ownership. "Having a greater variety of transportation modes at your fingertips helps make it increasingly easy to live without a car," he said. "That's why we want to provide alternatives to personal car ownership by bringing together multiple modes of transportation right in our app." Khosrowshahi said the new strategy does not move Uber away from a future that includes autonomous vehicles, despite a fatal accident involving one of its cars last month in Arizona. "Autonomy is part of the solution and long term it will be an important part of getting rid of car ownership," he said. The CEO said Uber was awaiting the results on an investigation into the March 18 accident that killed a pedestrian, but maintained that "autonomous (driving) will be safer long term." At the event, the company announced it would make aggregated traffic data to help planners in 12 new cities worldwide under its Uber Movement plan, to bring the total to 21. The new cites are Amsterdam, Bangalore, Brisbane, Cairo, Hyderabad, Melbourne, Mumbai, Nairobi, New Delhi, Perth, Pittsburgh and Toronto. Khosrowshahi took the helm at Uber in August after co-founder Travis Kalanick was forced out over a series of scandals and missteps, as well as allegations of unethical competition and a toxic work environment. Uber is the world's most valuable venture-backed startup, with a valuation of some $70 billion, with Khosrowshahi planning a public share offering in 2019. The deal to acquire Jump Bikes, a bike-sharing startup offering dockless electric bicycles, was announced Monday. Jump and Uber were previously partners and 250 red bikes -- which could be picked up or dropped off anywhere using built-in GPS -- have been available through the Uber app in San Francisco since the start of the year. Uber plans to add more of the bikes soon in the Washington area, for a total of around 400. 0 Response to "With bikes, transit, Uber unveils urban transport vision"